This post is sponsored by Egg Farmers of Canada but all the delicious opinions are my own. I grew up eating sweet eggs. One of my favourite breakfasts when I was little was Sweet Omelet (or Breadless French Toast as I call it now). 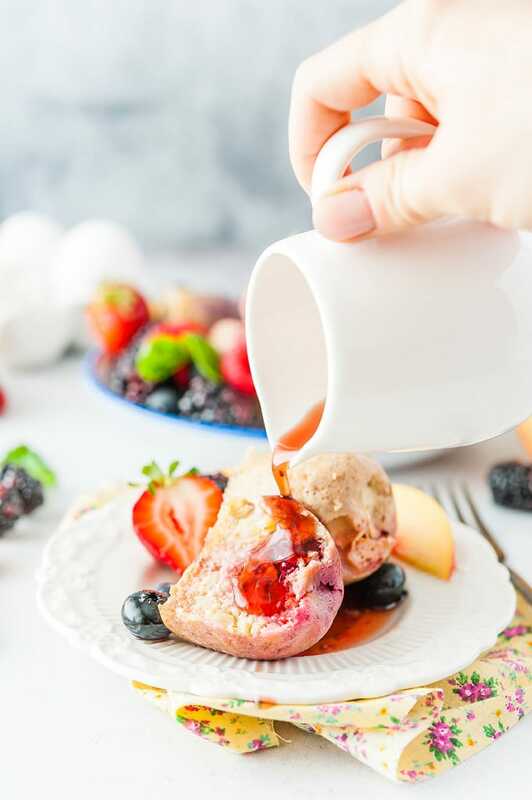 Even though the concept of sweet eggs may sound strange, I am sure most people actually are very familiar with the taste: delicious egg custard, berry-studded clafoutis, piping hot french toast. All of them are heavy on eggs and some kind of sweetener, be it sugar or fruit. 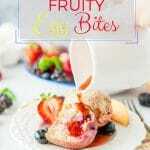 My Instant Pot Fruity Egg Bites are a mix between the famous Pinterest Egg and Banana Pancakes and light ricotta egg cakes. 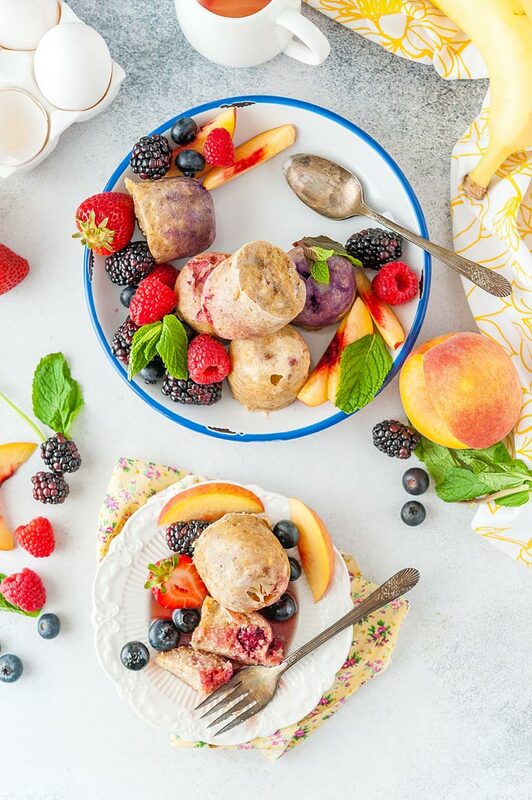 Made with bananas, Canadian eggs, a touch of quick oats for bulk, cinnamon for flavour, and ricotta for texture, they are a healthy and delicious breakfast that can be made in Instant Pot on the weekend and then eaten throughout the week. Great for meal prep! 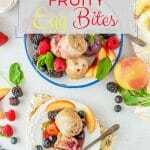 These Fruity Egg Bites are lightly sweetened with banana and fruits and berries. They are soft and fluffy. They taste eggy but they are supposed to taste like that. They aren’t called Egg Bites for nothing! 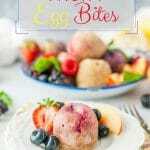 These Egg Bites are delicious hot from Instant Pot but I personally ate them cold right from the fridge also. Although, I definitely recommend warming them up. They are better that way! 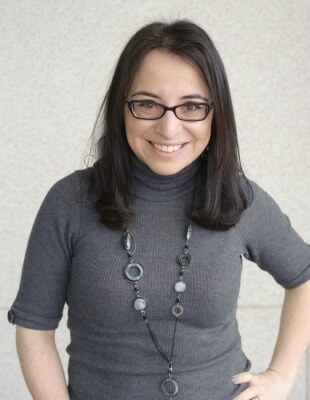 I’ve been seeing Instant Pot Egg Bites all over the Internet in the past few months. Eggs and cheese are a classic combination. I, however, wanted to make something different, unique, healthy, delicious! 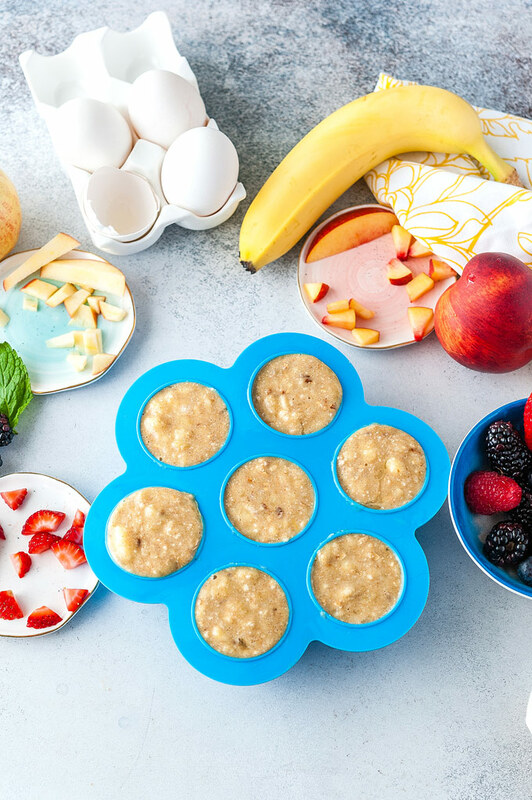 That’s how these Instant Pot Fruity Egg Bites came to be. 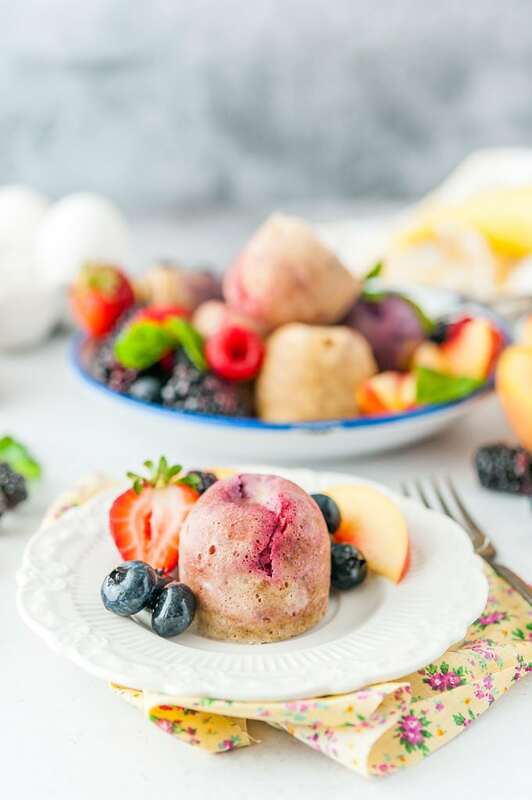 I took my recipe for Gluten-Free Apple-Banana Fritters and turned it into these amazing and quick Instant Pot Fruity Egg Bites. Did you know that October 12th is the World Egg Day? Well, it is! And it totally needs to be celebrated with all the eggs! Don’t forget to use #WorldEggDay hashtag on your social media when you share your delicious creations! I hope you get to spent some time with friends and family and enjoy with lots of eggs! Remember, eggs aren’t just for breakfast! They are an amazing source of protein for lunch and dinner also! One egg is only 70 calories and just 5 grams of fat! Read up on Egg Nutrition. 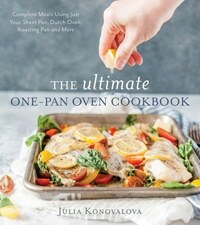 The Ultimate One-Pan Oven Cookbook – my new cookbook has a delicious oven omelet, another sheet pan egg breakfast, and a few more egg-based dishes! Get Cracking!! And let me know in comments how you will be enjoying eggs on World Egg Day! Just like many of my recipes, this one is also very easy. No matter where you purchase Canadian Eggs, they are from a local farmer. There are more than 1000 families in Canada that produce eggs and all Canadian egg farms are family-run! That’s actually amazing! So, by purchasing Canadian Eggs you support local family-run businesses! Egg farmers in Canada all adhere to the same National Animal Care and food-safety programs. It means that hens are well cared for and the eggs are always clean and fresh! For more information about Canadian Eggs, visit eggfarmers.ca or follow @eggsoeufs on Twitter and Instagram, and like Get Cracking on Facebook. 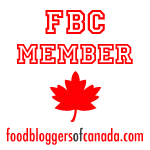 For recipes and nutrition, visit eggs.ca! You need a few accessories for your electric pressure cooker and just a little bit of time. 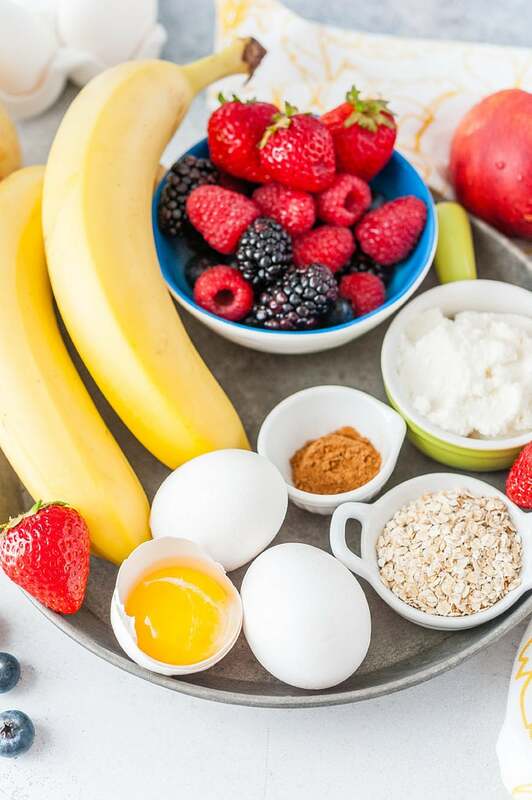 What are the ingredients to make Instant Pot Fruity Egg Bites? Ingredients are wholesome and healthy and delicious. 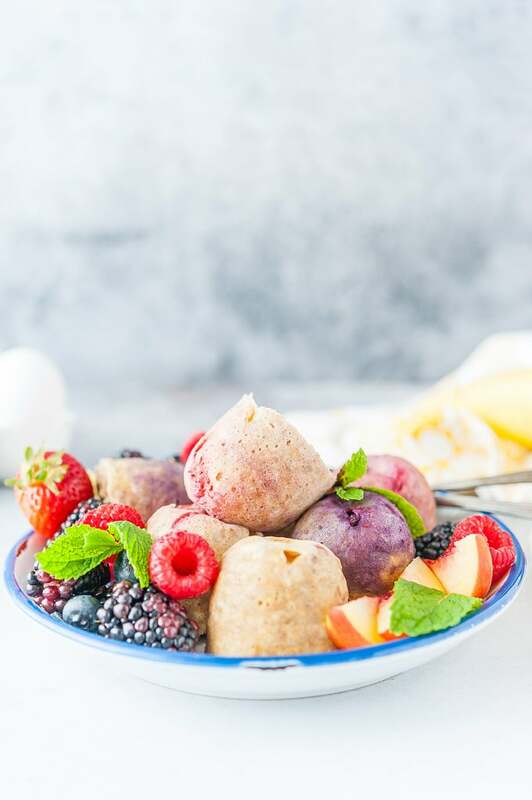 These Fruity Egg Bites are gluten-free and you can make them dairy-free by omitting the ricotta, although the texture will be different and the flavour a bit more eggy. 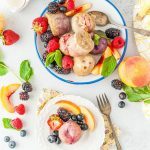 I personally prefer to use red or purple berries as they create the most beautiful egg bites with their juices. However, you can use yellow fruit as well. 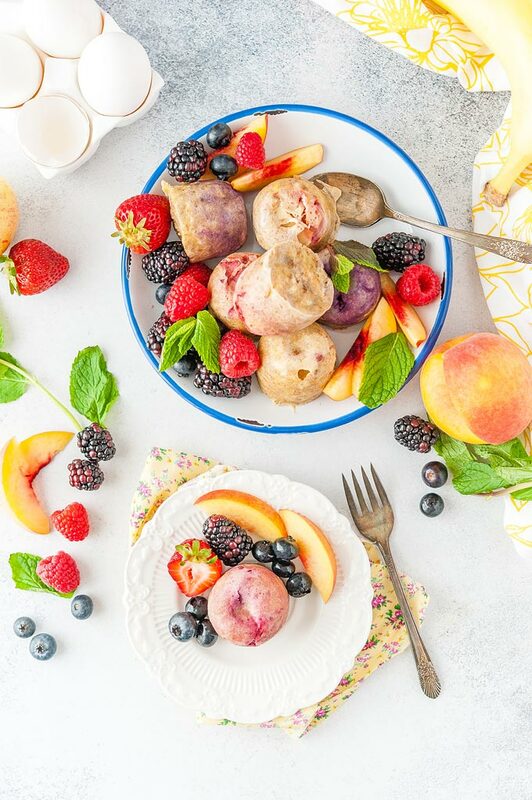 You can use fresh or frozen fruit! 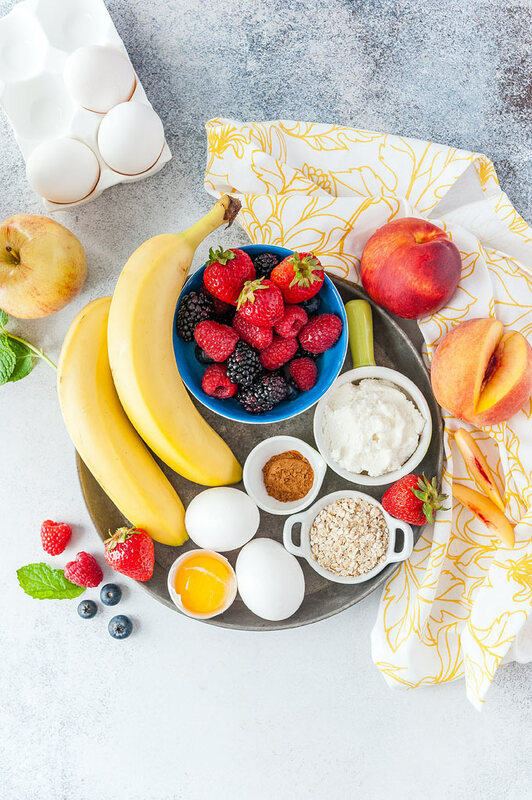 Leave me a comment with your favourite fruit or berry to add to these Fruity Egg Bites! In a medium bowl, mash the bananas very well. Add the quick oats, cinnamon, ricotta, and mix until well blended. Spray the egg bites mold with oil spray. Place about 1-2 teaspoons of diced fruit or whole berries at the bottom of the molds. Don't add too much as the egg batter will not fit otherwise. Pour the egg batter over the fruit. Pour 1 cup of water into Instant Pot insert. Place a trivet in the insert. Carefully place the foil-covered egg mold into Instant Pot. Press Manual or Pressure Cooker button (depending on your model) and using the arrow buttons set the cook time to 10 minutes. It will take between 7 to 9 minutes to come to pressure. Once the Instant Pot beeps that the 10 minutes of cooking are done, turn the sealing valve to do a Quick Release. It will take 1-2 minutes. 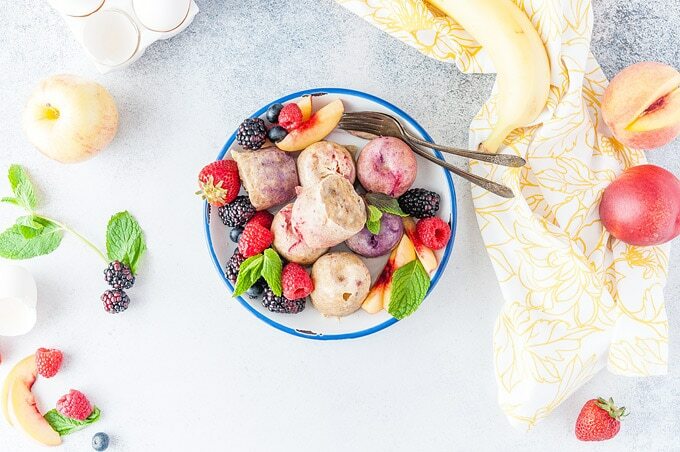 Very carefully remove the egg bites mold from Instant Pot. It will be very hot, so use kitchen gloves. Carefully pop the Fruity Egg Bites out of the mold. Serve hot with more fruit and maple syrup. Theses se sounded great bu mine came out super watery and mushy. Didn’t cook all the way…what might have i done wrong? Maybe it was a low pressure vs high pressure issue? I went with high pressure for 10 mins and they came out quite nice. I’m so glad you liked them! Thank you for letting me know!